The Whisky Wire are doing so well with their awesome Twitter Tastings, it seems they’re spilling out of their traditional Wednesday evening slots so today is Whisky Monday instead. 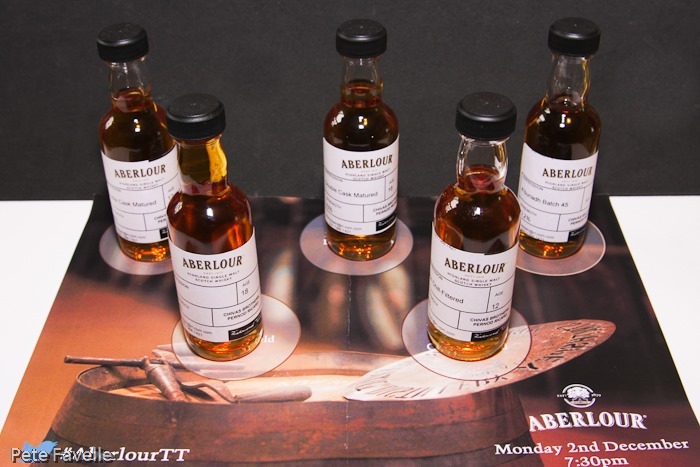 Aberlour is a Speyside distillery; both it and the village where it sits are named for the Lour, a spring which empties into the Spey right beside the distillery. I mention their location partly because previously I’ve listed them as a Highland distillery – misled, in part at least, by the big “Highland Whisky” label they print on all their bottles. I’m not quite sure why they do this, although perhaps the Highland region is a little more exclusive – half the distilleries in Scotland can be found nestling on the banks of the Spey. This evening’s tasting covers most of their core range, although curiously their own website doesn’t seem to mention either the Non Chill-Filtered 12 Year Old, or the entry level 10 Year Old that I tasted a long time ago and still seems to be in every supermarket. The nose is full of sweet caramel, with some unripe plum tones and a surprisingly heavy alcohol presence for the ABV. My fellow tweeters offer apple, orange peel and even banana notes – which I’m not so sure about – and boiled sweets, which I definitely detect. Given some time to sit in the glass, a banana edge definitely comes through. Watered, everything is flattened out, leaving you with the raw spirit and not much else. In the mouth, it’s sweet and almost creamy with red berries which are swiftly overwhelmed with a real peppery heat. There’s a lot of talk about cinnamon, but I can’t taste it myself. Again, adding water takes away a lot of that character and although it’s still a pretty tasty dram it doesn’t have that smooth, unctuous red fruit to it. The sherry character comes through more strongly on the nose, with raisins, toffee and a darker sweetness than with the 12 Year Old – it’s slightly reminiscent of Pedro Ximenez. Twitter nosings detect a lot more spice than I’m getting, although there’s certainly a hint of them underneath the sugars. There’s something else strangely familiar too, which Twitter finally helps me identify as plasticine – which isn’t nearly as wierd or unpleasant as that might sound! Watered, there’s much more wood on the nose; pencil shavings along with hints of bitter dark chocolate. In the mouth, it’s much less sweet and syrupy than the nose had me expecting; spices around the edge, suggestions of honey sweetening the otherwise quite finish. Curiously, others find it to be significantly sweeter than I do. Water actually brings the honey more to the fore, and there’s definite almost tannic oak lurking in the finish. I was expecting this to be overwhelmingly alcoholic on the nose, but to my surprise, it’s positively gentle. It’s sherry-heavy again, having been matured exclusively in Oloroso butts – dried fruit, gentle dark spices and Twitter nails it as “Christmas pudding”. Below all those heavy aromas is a delicate vanilla and chocolate. With water calming the alcohol down, the fruit becomes lighter but there are still dry, lightly toasted spices in the background. The alcohol certainly makes itself felt in the mouth; powerful and almost washing everything else out at first. Brown sugar and prunes struggle out from under the spirit, some rum-like flavours and a touch of nutmeg joining toward the finish. Water takes the sting of that alcohol away without really disturbing the other flavours; still sweet with dark fruits and a dryness to the finish. This is the first whisky of the evening that doesn’t scream its sherry maturation loudly on the nose – soft green fruit, citrus blossom and a touch of pear drops, although it retains the warmth of the sherry cask. As it sits longer in the glass, more wood aromas come through, and slightly mask the lighter fruit notes. Water leaves the main notes alone, although those sherry characteristics show through a little more strongly. In the mouth, it’s remarkably smooth; gently sweet autumnal fruit which slowly yields to quite a bitter, slightly cinnamon edge. There’s a light honey dancing all the way through and it’s the sort of whisky that ends up being way more than just one dram! Water just turns the volume down on everything, taking a lot the joy away – however, what it does do is to expose more of the oak character underneath. In another whisky, that would be a nice additional layer, but the price of losing that smooth, sweet fruit is too high. I was expecting this to be very similar to the Double Cask Matured 12 Year Old, but it’s actually very different. The nose is smooth and creamy, with delicate red fruit overtones – I described it as “raspberry yoghurt” on Twitter, but that’s not quite it – it’s those milky boiled sweets you used to be able to get in my youth. Water, curiously, leaves the nose almost untouched. I’ve seen ‘custard’ used to describe several of these whiskies through the evening, and finally I can understand where people are coming from – there’s something sweet, creamy and vanilla about it that definitely conjures up custard. On the tongue it’s almost aggressively spiced, with oak and a nuttiness eclipsing the fruitier notes. Water calms those spices down and they become a very pleasant, warming background to free up other flavours – fresh green apples and honey. 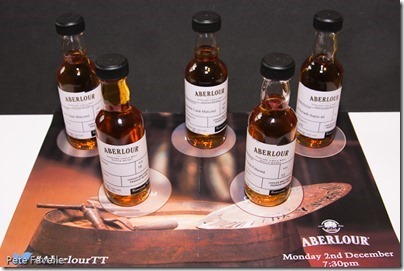 Once again, my thanks to Aberlour and The Whisky Wire for this evening’s dramming! The 16yr sounds like something I might enjoy…I’ll put that on my list. Thanks for the notes!